Before electricity became sufficiently widespread and economical to allow for general public use, gas was the most popular means of outdoor and indoor lighting in cities and suburbs. Early gas lights had to be lit manually, but many later designs are self-igniting. It must be remembered that the last gas lighting workers finished in London during the 1950s. Gas lighting competed with the development of electric light for many years. In addition, some urban historical districts retain gas street lighting, and gas lighting is used indoors or outdoors to create or preserve a nostalgic effect as well as a status symbol among the elite. Among the economic impacts of gas lighting, was much longer work hours in factories. This was particularly important in Great Britain during the winter months when nights are significantly longer. Factories could even work continuously over 24 hours, resulting in increased production. Following successful commercialization, gas lighting spread to other countries. 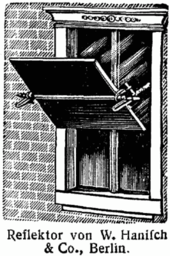 Once used extensively in office buildings, the adjustable light reflector is seldom in use today having been supplanted by a combination of other methods in concert with artificial illumination. The reflector had found favor where the choices of artificial light provided poor illumination compared to modern electric lighting. Architectural lighting design coincides with the rapid development of cities and electric light to achieve what was coined at the turn of the century as "nocturnal modernity". The image of a New York City night scape with electric light spurned the imagination. The potential of electric light as a new building “material” was recognized in the 1920s and became a useful design tool by the mid-century. Skillful lighting allowed for theatricality, narrative, and a new emphasis on structure and space. These ideas of using at the time new light source of electricity and mass-produced glass walls for daylighting were first experimented with by Josef Hoffmann of the Vienna Secession and Wiener Werkstätte, Walter Gropius' art school, known as Bauhaus of 1919 and Russian state art and technical school in Moscow, known as Higher Art and Technical Studios and abbreviated simply as Vkhutemas. With the exodus from Europe after the second world war the Bahaus brought its modern ideas to the United States. Mies van der Rohe and Walter Gropius ideas were brought to America and quickly taken up by architects such as Phillip Johnson in the conceptual Glass House a supreme example of the use of daylighting and natural light. They both used the lighting designer Richard Kelly who was one of the field’s most influential figure in developing Lighting design as a professional in the United States. One of the oldest architectural lighting manufacturers in the world today is run by the fourth generation of the Baldinger family, Howard Baldinger of HB Architectural Lighting( http://www.hblightinginc.com/ ). Started in 1893 in Pennsylvania, the Baldinger family created a name for themselves by their continuous execution of high quality manufacturing of architectural lighting. They produced lighting design by some of the most famous designers of the twentieth century. Their high quality craftsmanship continues to this day with some of the most highly regarded institutions among the Hospitality Industry, among others. Extensive luminaire photometric designing calls for consideration of the amount of functional light present, the energy expended, as well as the aesthetic impact supplied by the lighting system. Some buildings, like surgical centers and sports facilities, are primarily concerned with providing the appropriate amount of light for the associated task. Some buildings, like warehouses and office buildings, are primarily concerned with saving money through the energy efficiency of the lighting system. Other buildings, like casinos and theatres, are primarily concerned with enhancing the appearance and emotional impact of architecture through lighting systems. Therefore, it is important that the sciences of light production and luminaire photometrics are balanced with the artistic application of light as a medium in our built environment. These electrical lighting systems should also consider the impacts of, and ideally be integrated with, daylighting systems. Factors involved in lighting design are essentially the same as those discussed above in energy conservation analysis. An important property of light fixtures is the luminous efficacy or wall-plug efficiency, meaning the amount of usable light emanating from the fixture per used energy, usually measured in lumen per watt. A fixture using replaceable light sources can also have its efficiency quoted as the percentage of light passed from the "bulb" to the surroundings. The more transparent the lighting fixture is, the higher efficacy. 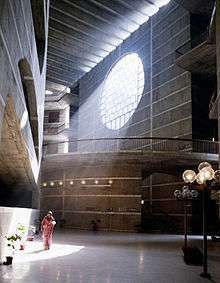 Shading the light will normally decrease efficiency but increase the directionality and the visual comfort probability. The PH-lamps are a series of light fixtures designed by Danish designer and writer Poul Henningsen from 1926 onwards. The lamp is designed with multiple concentric shades to eliminate visual glare, only emitting reflected light, obscuring the light source. The lamps are still in production today. 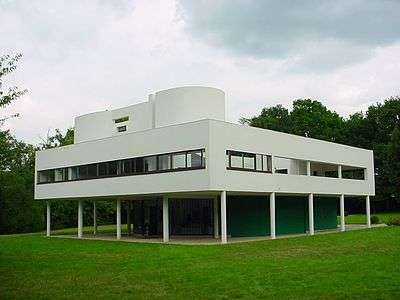 Villa Savoye, France (1929–31) by architect Le Corbusier. The second floor includes long strips of ribbon windows that allow unencumbered views of the large surrounding garden, and which constitute the fourth point of his five-point system for architecture. General Motors Technical Center 1949, architect Eero Saarinen, lighting design by Richard Kelly. George Izenour, theatrical lighting designer. His patents form the modern lighting control consoles. The protective housing is concealed behind a ceiling or wall, leaving only the fixture itself exposed. The ceiling-mounted version is often called a downlight. Jargon for inexpensive downlighting products that are recessed into the ceiling, or sometimes for uplights placed on the floor. 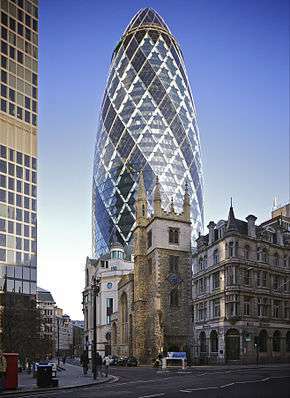 The name comes from the shape of the housing. The term "pot lights" is often used in Canada and parts of the US. Recessed into the ceiling in a long box against a wall. Recessed fluorescent light fixtures, usually rectangular in shape to fit into a drop ceiling grid. Provide up or down lights; can be used to illuminate artwork, architectural details; commonly used in hallways or as an alternative to overhead lighting. Individual fixtures ("track heads") can be positioned anywhere along the track, which provides electric power. Used to illuminate walkways, parking lots, roadways, building exteriors and architectural details, gardens, and parks. A type of architectural outdoor lighting that is a short, upright ground-mounted unit typically used to provide cutoff type illumination for egress lighting, to light walkways, steps, or other pathways. 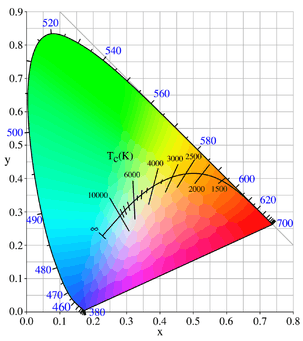 Different types of lights have vastly differing efficiencies and color of light. LED technology is useful for lighting designers because of its low power consumption, low heat generation, instantaneous on-and-off control, and in the case of single color LEDs, continuity of color throughout the life of the diode and relatively low cost of manufacture. For general domestic lighting, total cost of ownership of LED lighting is still much higher than for other well established lighting types. ↑ Williams, Ben (1999). "A History of Light and Lighting". Retrieved 23 November 2012. ↑ "Chandler". The Free Dictionary By Farlex. Retrieved 2012-05-19. ↑ Chris George (2008). Mastering Digital Flash Photography: The Complete Reference Guide. Sterling Publishing Company. p. 11. ISBN 978-1-60059-209-6. ↑ "The PH lamp", Design, Visit Denmark . 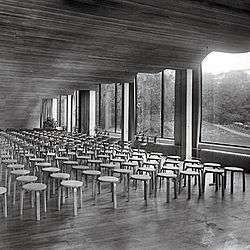 ↑ "Poul Henningsen", Designers, Louis Poulsen Lighting . ↑ Rüdiger Paschotta (2008). Encyclopedia of Laser Physics and Technology. Wiley-VCH. p. 219. ISBN 978-3-527-40828-3. ↑ Thomas Nimz, Fredrik Hailer and Kevin Jensen (2012). Sensors and Feedback Control of Multi-Color LED Systems. LED Professional. pp. 2–5. ISSN 1993-890X. ↑ Wallace Roberts Stevens (1951). Principles of Lighting. Constable. ↑ Parrott, Steve. "Moonlighting: Landscape Lighting Design Imitates Nature". Retrieved 2011-09-29. ↑ "OSRAM SYVLANIA XBO" (PDF). ↑ Watkin, David (1996). The History of Western Architecture (Second ed.). Laurence King Publishing. pp. 508–509. ISBN 1-85669-082-2. ↑ Perkowitz, Sidney; Henry, A. Joseph (23 November 1998). Empire of Light:: A History of Discovery in Science and Art. Joseph Henry Press. ISBN 978-0309065566. Retrieved 4 November 2014.